Here at the Austin Shade Team, we know that the Texas summers can be difficult. The heat can wreak havoc on not only your energy, but the energy of your home (or, at least, its energy bill). We would never want our Jollyville friends to suffer through the summer without proper relief, which is why we’re proud to offer our custom solar shade installation service to our friends in Jollyville. Now, you too can experience the benefits of custom solar shades and solar window screens. You’ll notice an exponential difference in the temperature of your home, meaning you won’t have to blast your air conditioner through all hours of the day. Instead, our solar shades block the sun’s rays from penetrating, so that your home will remain cool, refreshing, and habitable. Contact us today to schedule your initial estimate. We’ll come to your Jollyville home, inspect your windows, and get started on providing you with the ultimate relief from the sun’s heat! Our custom solar roller shades can be installed to provide relief to your home’s interior, but the more practical use of them is for the outdoor patio. Here’s a picture of a custom exterior solar roller shade, that was made out of our Brown 90% roller shade fabric. The same fabric that we use to make our solar window screens out of. These roller shades are made using very heavy duty clutches (RollEase G24 and G400 Exterior Clutches), stainless steel chains so they don’t rust or break, and a very heavy duty aluminum bar at the bottom to hold and weigh down the roller shades. All these roller shades are also tied down at the bottom left and right sides to keep the roller Shades from blowing around in the Wind. Even though the roller shades are tied down, you do need to stay on top of them when it’s windy, because that fabric when rolled down is a large area that the wind can play Havoc with. These roller shades are controlled manually, meaning with a pull chain that loops around a clutch, you roll the shade down and then back up. These roll Shades because they are manual, and we are the manufacturer for them, your installed Roller Shade Pricing is ridiculously inexpensive. That’s inexpensive compared to everybody else out there that does the same thing, or compared against that of using motorized roller shade systems. Imagine being able to sip a glass of ice cold sweet tea from the comfort of your back porch in the middle of the day. With our roller sun shades, you can. We’ll install these custom solar shades with the right density and fabric color to perfectly compliment the paint of your home and give you optimum shade. 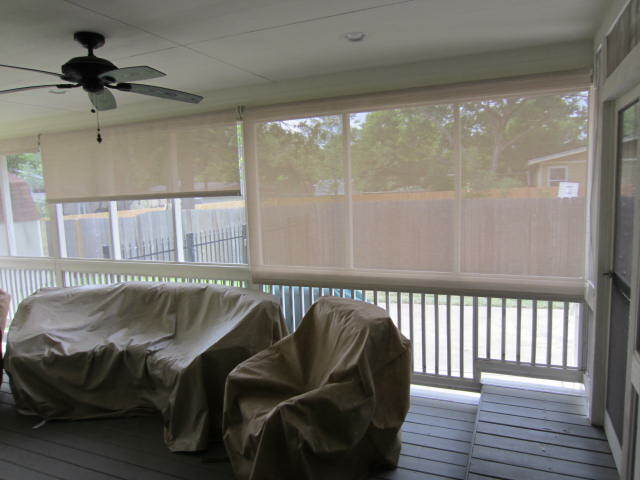 If you have a screened-in back patio porch, like shown here in this picture, our custom-made roller shades are an ideal shade solution for you. You’re keeping the bugs and insects from getting into the enclosed area through that of your screened in patio, but now you’re going to want to get sun protection for your screened-in area. 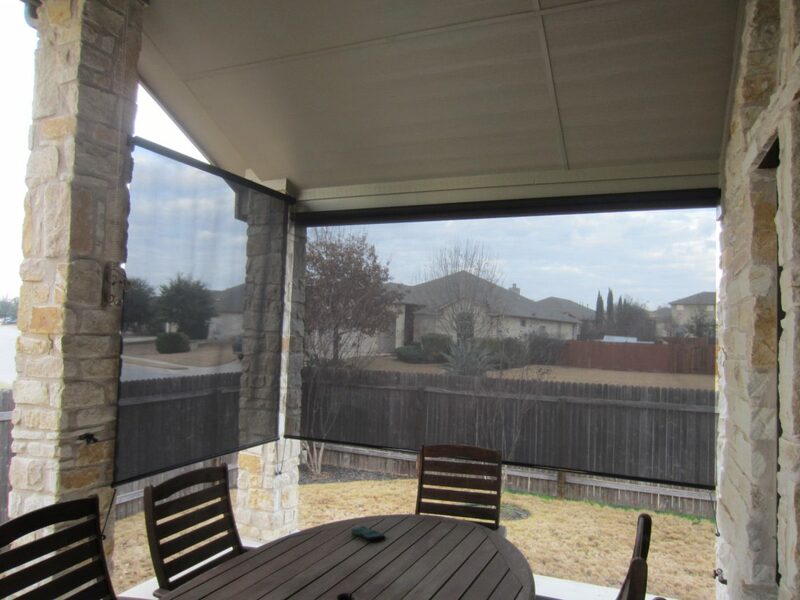 So, instead of replacing all of that bug screen fabric that makes up your screened-in patio with solar screen fabric, the better answer, a better solution, is two install these patio roll shades. Learn more about our custom solar roller shades by visiting our Frequently Asked Questions page. A custom solar window screen is a window shade screen made to fit over an entire window designed to provide shade for that window. Custom solar screens come and five different horse, the comment chocolate brown color, black color, stucco color, beige color, and a light bluish looking gray color. We will be introducing a new light brown come 2018. 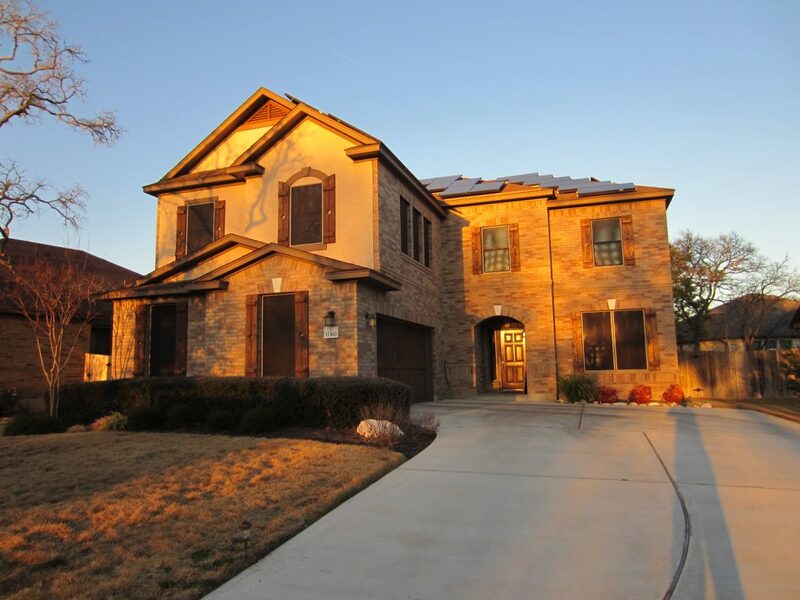 This light brown will be similar to the stucco exterior of the home represented in the following picture. Our solar screens come in two shade densities, 80% shade and 90% shade. When you wrap a home with our solar screens, we recommend that you use the 80% solar screens for most of your windows and the 90% solar screens for your problematic windows, those Windows that face the West that get pounded by the afternoon sun. 80% shade for all of your other windows is a sufficient amount of shade for your home. We recommend that 90% shade fabric for the west-facing windows because here and Austin that sun can be. Facing windows from noon until 8:30 to 9 in the evening. That is a long time for the sun to be heating up that glass. Because of this, because the sun is just clobbering certain windows for an extended period of the day, the hottest part of the day, we recommend that extra 10% shading. Our custom solar screens are manufactured by us to aid in quality and pricing, meaning there’s no reason for you to haggle with other companies. We’ll come to your Jollyville home, measure your windows, and get right to work on fitting your custom solar screens to every window of your home, or just the ones that receive the most sunlight. The choice is yours! Learn more about our solar window screen pricing or contact the Austin Shade Team today.